It's time for another meet at Pinnacle! The Recreational Meet comes to Pinnacle twice a year, December and May, providing the perfect opportunity for your child to showcase the skills they have been working on all year. Parents are invited into the gym to experience their child's progress up close. Gymnasts begin the event with a group warm up. Next, they divide into groups of similar age/skill level. Once in their groups each gymnast is announced one at a time and performs their routine. This process is repeated until each gymnast has had a turn on each event. Gymnasts salute, the crowd applauds, and coaches give high fives after each routine. At the conclusion of all of the performances, each gymnast is recognized one at a time and presented a certificate of completion and a paricipation trophy. Ask any 5 year old and the trophy might be at the top of the list as a reason to parcipate. However, the experience is about much more than the trophy at the end. 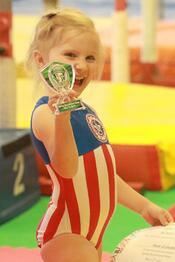 Gymnasts work throughout the year to learn new skills and perfect their current skills. It is important to have a chance to showcase the skills they have been learning. In his article about music lessons, Brian Jenkins, asks,"Can you imagine soccer practice if you were never going to have a game? If you’re not preparing for anything, the motivation to practice hard goes away." Giving your child a chance to showcase what they have worked so hard on can be very rewarding and will likely motivate them for future practices. According to Catherine Kolkoski, "participating in a scheduled performance helps kids set goals, develop self-discipline, self-motivation, patience and a desire to set goals and succeed". Children are often nervous to perform in front of a crowd, but the encouragement of the audience at the recreational meet allows each partipant to leave beaming with pride! Mistakes are a part of life and sports. When children witness one of their friends make a mistake or get back up after a mistake themself this is an invaluable life lesson. The concept that mistakes happen is reinforced when they see their coach or parent cheer, support, and provide words of encouragement after they rebound from a mistake. 1. Prepare your child for the experience - Let them know what to expect. New experiences can be overwhelming. Let your child know that the spectators will be in the gym, instead of the lobby. Tell your child that the audience will be cheering for them. Let them know that it is okay to be both nervous and excited to perform. Enrourage them to do their best and have fun. 2. Show your support - Enjoy watching your son or daughter perform. Enjoy watching their interaction with their coaches and peers. Recognize the hardwork your child has put in learning the skills and routines, regardless of how they perform them. 3. Capture the memories - The day is full of smiles, beaming faces, high fives, thumbs up, laughs, and fun! Take videos and pictures and share them with family, friends, and of course Pinnacle. Sign up here or contact us for more information.